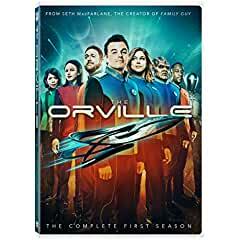 From Emmy®* Award-winning executive producer and creator Seth MacFarlane (“Family Guy,” Ted, “Cosmos: A SpaceTime Odyssey”), “The Orville” is a live-action, one-hour space adventure series set 400 years in the future that follows The U.S.S. Orville, a mid-level exploratory spaceship. Its crew, both human and alien, face the wonders and dangers of outer space, while also dealing with the problems of everyday life. The ensemble series stars MacFarlane as the ship's Captain, Ed Mercer, and Adrianne Palicki (“Marvel's Agents of S.H.I.E.L.D.,” “Friday Night Lights”) as his ex-wife, who's assigned as his First Officer. Additional cast members include Penny Johnson Jerald (“24,” “The Larry Sanders Show”), Scott Grimes (“American Dad!,” “Justified”), Peter Macon (“Shameless,” “Bosch”), Halston Sage (Neighbors, Goosebumps), J Lee (“American Dad!,” “The Cleveland Show”), Mark Jackson (“That Royal Today”) and Chad L. Coleman (“The Walking Dead,” “The Wire”).